1 x 10 Model # PS110U . 3 piece convertible rear panel. 18" wide x 16" tall x 12" deep. 1 x 15 Model # PS115U . 3 piece convertible rear panel. 20" tall x 20" wide x 12" deep. 21 lbs. 3 weeks lead time. Wide 1 x 12 unfinished pine cabinet. Model # PW112U. 25"wide x 16"tall x 12" deep. 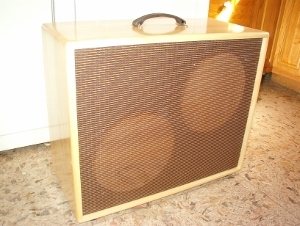 2 x 10 Model PS210U. 3 piece convertible rear panel. 25" wide x 16"tall x 12"deep. NEW! TRM deluxe cabs come with 3 piece convertible rear panels. 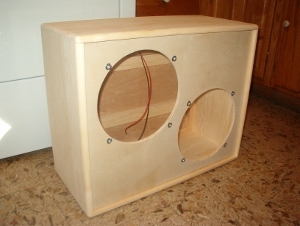 available with a TRM speaker cabinet. NEW! Diagonal 212...unfinished, tung oiled, or tolexed versions. Unfinished pine diagonal 212. 26"w x 21"h x 12" deep. 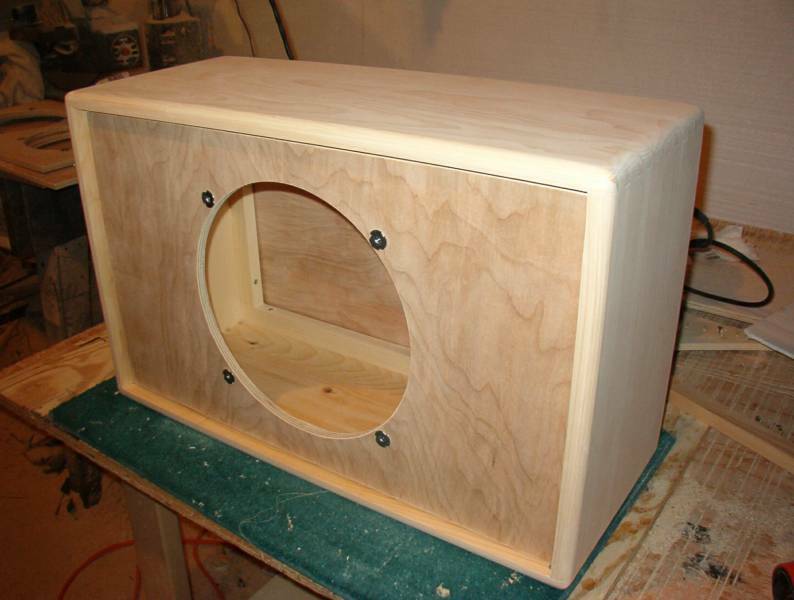 1/2" birch plywood baffle and rear panel. 26 lbs. 3 weeks lead time. Same as above except with glossy hand rubbed finish, oxblood with gold stripe grill cloth, Fender style dogbone handle, and large rubber cab feet. Ready for you to load your speakers. Tolexed with black grill cloth, white piping, black strap handle, corners. Other color options are available. 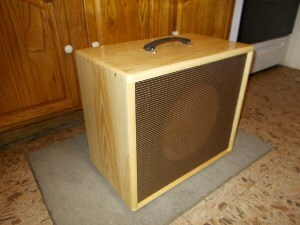 Please contact me if you have a specific tolex and/or grill color preference. I can access most styles and colors. Price as shown is $429.95 FREE U.S. shipping. 28 lbs. Glossy hand rubbed version with oxblood w/gold stripe cloth and Fender style dogbone handle. Wired and ready for your speakers. Price is $419.95 FREE U.S. shipping. PS212 w/ 3 piece back. NEW 12" deep design. The SWEET spot! Unfinished for project. 3 piece rear panel. 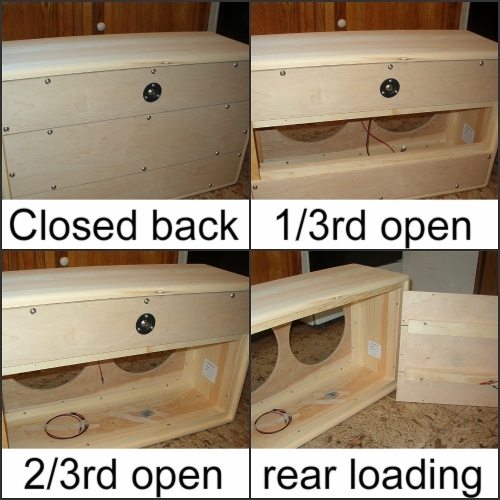 Includes wiring and speaker mounting hardware. 20"w x 17-1/2h x 12"deep. Price: $154.95. + $35.00 shipping. PS112 w/ 3 piece rear panels. New 12" deep design. The SWEET spot! with glossy finish with oxblood w/gold stripe grill cloth and Fender style dogbone handle. Wired up and ready for your speaker. Price: $379.95 FREE U.S. shipping. 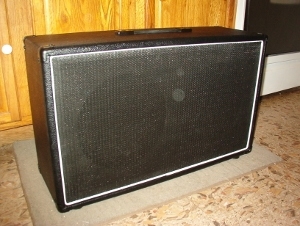 Black tolex with black grill and white piping, corner, strap handle, and large rubber cab feet. Wired and reay for your speaker. Black tolex, black grill, white piping, corners, strap handle, and large rubber cab feet. Ready for your speakers. PS210 with 3 piece rear panels. NEW 12" deep design. The SWEET spot! #PS210TO Same as above but, with glossy finish with oxblood w/gold stripe cloth, Fender style dogbone handle, large rubber cab feet. Wired and ready for your speakers. Black tolex, black grill, white piping, corners, strap handle, and large rubber cab feet. Wired and ready for your speakers. Price: $419.95 FREE U.S. shipping. PS110 with 3 piece rear panels. New 12" deep design. The SWEET spot! #PS110TO Same as above but, with glossy finish with oxblood w/gold stripe cloth, Fender style dogbone handle, and rubber feet. 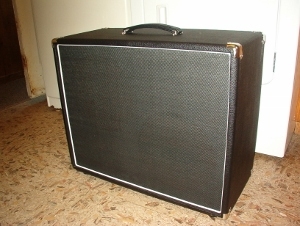 Black tolex with black grill and white piping, corner, strap handle, and large rubber cab feet. Wired and ready for your speaker. #PS115TO Same as above but, with glossy finish with Fender style dogbone handle, oxblood w/gold stripe grill cloth, large rubber feet. Wired and ready for your speaker. Price $389.95 FREE U.S. shipping. 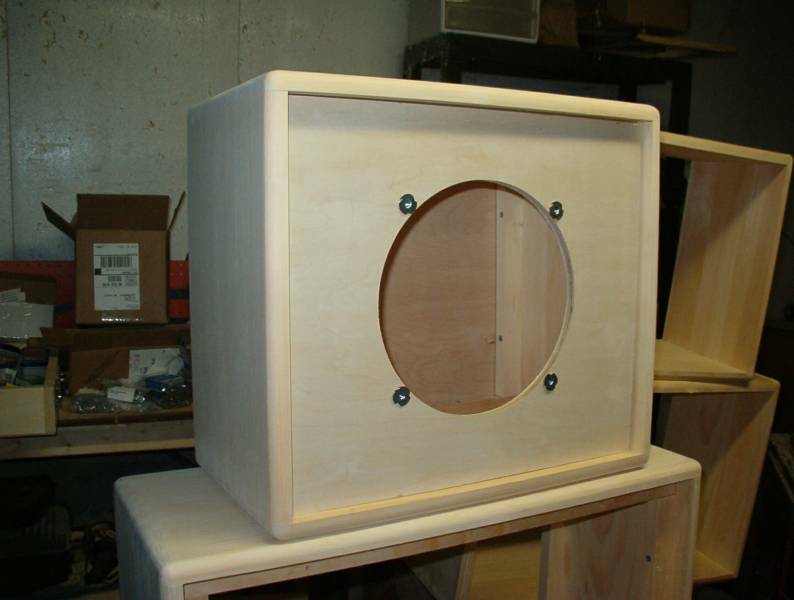 PS115 cabs with 3 piece rear panels. New 12" deep design. The SWEET spot! Black tolex, black grill, white piping, strap handle, corners, and rubber feet. Wired and ready for your speaker. Price: $389.95 FREE U.S. shipping. #PS212U. 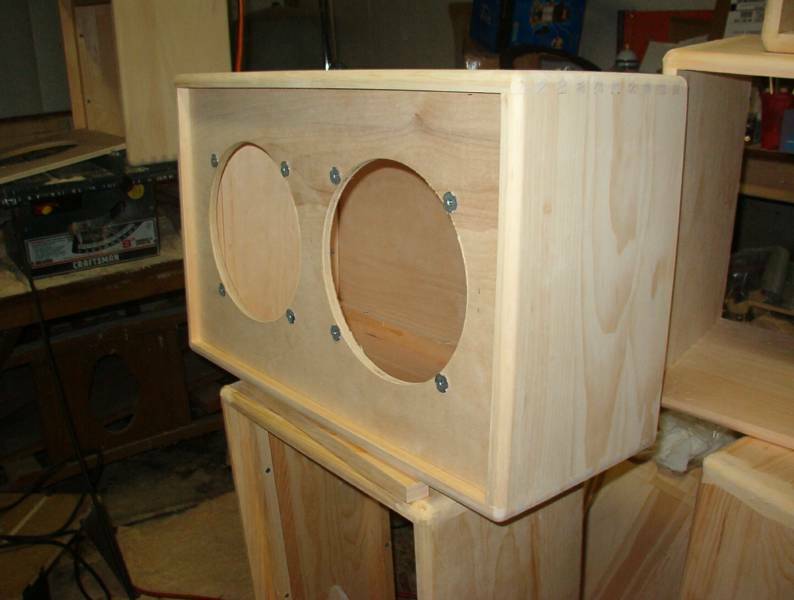 29"w x 17-1/2"h x 12"d.
3 piece rear panel, 3/4" pine with 1/2" birch baffle and rear panels. prewired and ready to finish. 24 lbs. 3 weeks lead time. Wide body 112. New 12" deep design. The SWEET spot! oxblood w/stripe cloth. Fender style brown dogbone handle, wired and ready to load. 25:w x 16"h x 12"deep. 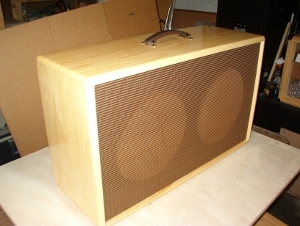 PW112TX Same as above but with tolex covering, grill cloth, corners, handle, feet, wired and ready to load. 25"wide x 16"h x 12" deep. PLEASE NOTE; Due to a recent influx of orders there is now a 3 week lead time for unfinished cabinets and 4 - 5 weeks for finished cabinets.